(Newser) – Marika Stone was cycling with two friends on the afternoon of Dec. 30, 2017, when the Bend, Ore., dentist was struck and instantly killed by a GMC Sierra that crossed the center line as it drove toward the group. 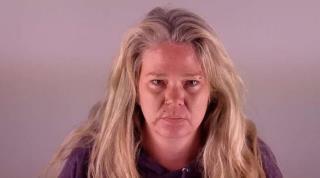 Now, the trial has begun for the driver, who is charged with manslaughter in the 38-year-old's death—and in court records filed this week, the Deschutes County District Attorney’s office says Shantel Lynn Witt had at least 11 medications in her system at the time of the crash, and that one of those medications was Xanax that had been prescribed to her dog, Oregon Live reports. Prosecutors say that in addition to a pill bottle with the dog's name, Lola, on it, three empty beer cans, a handgun, and a Taco Bell receipt from the day of the crash were found in Witt's truck. "and a Taco Bell receipt from the day of the crash..." Well there's your problem right there. NO ONE can control an explosive diarrhea and drive at the same time. She's a real nit "Witt". She should have cut the cheese on that bean burrito. Her poor dog probably had anxiety from living with her and being deprived of it's Xanax.